One of the most difficult tasks in debugging software for a developer is to understand the nature of the fault. Techniques have been proposed by researchers that can help locate the fault, but mostly neglected is a way to describe the nature of the fault. We are developing software models, visualizations, and techniques to aid in the diagnosis of the faults in the software. Revealing Runtime Features and Constituent Behaviors within Software. Vijay Krishna Palepu, James A. Jones. Proceedings of the IEEE Working Conference on Software Visualization (VISSOFT), Bremen, Germany, September 2015, pp. 1–10. Software engineers organize source code into a dominant hierarchy of components and modules that may emphasize various characteristics over runtime behavior. In this way, runtime features may involve cross-cutting aspects of code from multiple components, and some of these features may be emergent in nature, rather than designed. Although source-code modularization assists software engineers to organize and find components, identifying such cross-cutting feature sets can be more difficult. This work presents a visualization that includes a static (i.e., compile-time) representation of source code that gives prominence to clusters of cooperating source-code instructions to identify dynamic (i.e., runtime) features and constituent behaviors within executions of the software. In addition, the visualization animates software executions to reveal which feature clusters are executed and in what order. 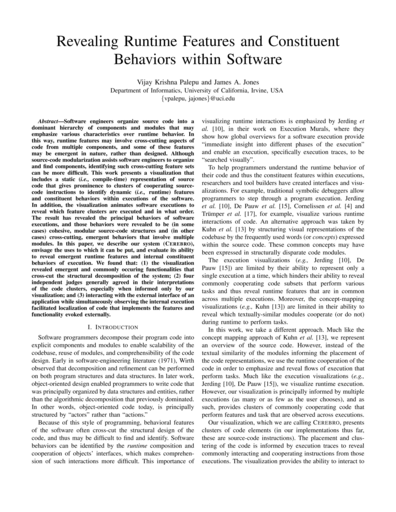 The result has revealed the principal behaviors of software executions, and those behaviors were revealed to be (in some cases) cohesive, modular source-code structures and (in other cases) cross-cutting, emergent behaviors that involve multiple modules. In this paper, we describe our system (Cerebro), envisage the uses to which it can be put, and evaluate its ability to reveal emergent runtime features and internal constituent behaviors of execution. We found that: (1) the visualization revealed emergent and commonly occuring functionalities that cross-cut the structural decomposition of the system; (2) four independent judges generally agreed in their interpretations of the code clusters, especially when informed only by our visualization; and (3) interacting with the external interface of an application while simultaneously observing the internal execution facilitated localization of code that implements the features and functionality evoked externally. Nicholas DiGiuseppe. Dissertation. University of California, Irvine, Irvine, California, USA, 2015, pp. 1–132. The overall debugging process is a complicated and troublesome task, involving several stages and dimensions of human comprehension. Developers seek understanding of several aspects of faults, such as, where the faults are located in the code, what sequences of actions invoke faults that cause failures, and why the program is failing due to the faults. Despite a large body of research for providing automation for the first two tasks, very little work has been conducted in helping to assist in the last question of “why” — that is, for describing the nature of the fault. I propose an automated approach to describe software faults that can indicate the nature of faults and their failures; thus ameliorating comprehension and reducing manual effort. 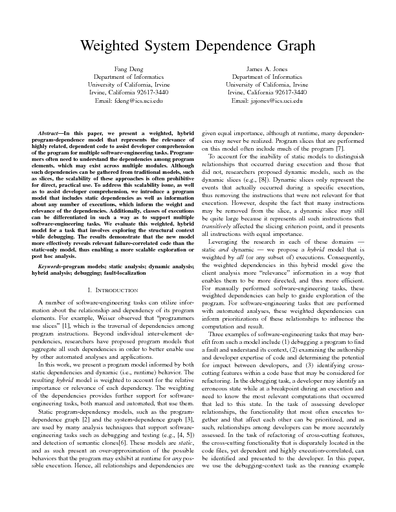 To create this automated approach I propose using a combination of dynamic analysis techniques with information retrieval and text mining to generate natural language clues. In this document I outline the design of my technique along with a research plan that I have used to investigate the effectiveness of using a such an approach. In particular, I detail five evaluations that provide a thorough assessment of the relative merits and shortcomings of the proposed technique. Visualizing Constituent Behaviors within Executions. Vijay Krishna Palepu, James A. Jones. 1st IEEE Working Conference on Software Visualization, New Ideas and Emerging Results Track (VISSOFT-NIER), Eindhoven, Netherlands, September 2013, pp. 1–4. In this New-Ideas-and-Emerging-Results paper, we present a novel visualization, The Brain, that reveals clusters of source code that co-execute to produce behavioral features of the program throughout and within executions. We created a clustered visualization of source-code that is informed by dynamic control flow of multiple executions; each cluster represents commonly interacting logic that composes software features. In addition, we render individual executions atop the clustered multiple-execution visualization as user-controlled animations to reveal characteristics of specific executions—these animations may provide exemplars for the clustered features and provide chronology for those behavioral features, or they may reveal anomalous behaviors that do not fit with the overall operational profile of most executions. Both the clustered multiple-execution view and the animated individual-execution view provide insights for the constituent behaviors within executions that compose behaviors of whole executions. Inspired by neural imaging of human brains of people who were subjected to various external stimuli, we designed and implemented The Brain to reveal program activity during execution. The result has revealed the principal behaviors of execution, and those behaviors were revealed to be (in some cases) cohesive, modular source-code structures and (in other cases) cross-cutting, emergent behaviors that involve multiple modules. In this paper, we describe The Brain and envisage the uses to which it can be put, and we provide two example usage scenarios to demonstrate its utility. Nicholas DiGiuseppe, James A. Jones. 20th International Symposium on the Foundations of Software Engineering, New Ideas Track (FSE-NIER), Cary, North Carolina, USA, November 2012, pp. 29:1–29:4. When attempting to determine the number and set of execution failures that are caused by particular faults, developers must perform an arduous task of investigating and diagnosing each individual failure. Researchers proposed failure-clustering techniques to automatically categorize failures, with the intention of isolating each culpable fault. The current techniques utilize dynamic control-flow to characterize each failure to then cluster them. These existing techniques, however, are blind to the intent or purpose of each execution, other than what can be inferred by the control-flow profile. We hypothesize that semantically rich execution information can aid clustering effectiveness by categorizing failures according to which functionality they exhibit in the software. This paper presents a novel clustering method that utilizes latent-semantic-analysis techniques to categorize each failure by the semantic concepts that are expressed in the executed source code. We present an experiment comparing this new technique to traditional control-flow-based clustering. The results of the experiment showed that the semantic-concept clustering was more precise in the number of clusters produced than the traditional approach, without sacrificing cluster accuracy. 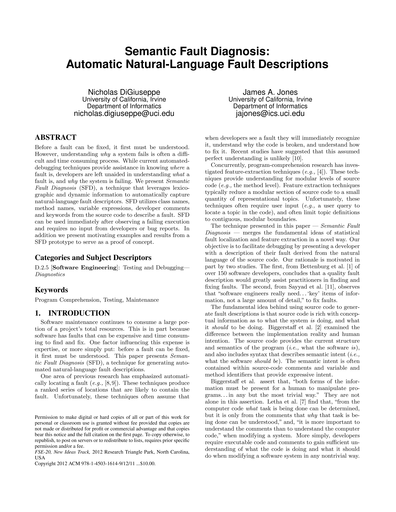 Semantic Fault Diagnosis: Automatic Natural-Language Fault Descriptions. Nicholas DiGiuseppe, James A. Jones. 20th International Symposium on the Foundations of Software Engineering, New Ideas Track (FSE-NIER), Cary, North Carolina, USA, November 2012, pp. 23:1–23:4. Before a fault can be fixed, it first must be understood. However, understanding why a system fails is often a difficult and time consuming process. While current automated-debugging techniques provide assistance in knowing where a fault is, developers are left unaided in understanding what a fault is, and why the system is failing. 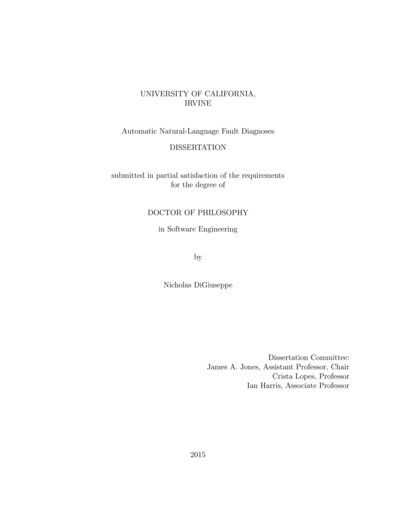 We present "Semantic Fault Diagnosis" (SFD), a technique that leverages lexicographic and dynamic information to automatically capture natural-language fault descriptors. SFD utilizes class names, method names, variable expressions, developer comments and keywords from the source code to describe a fault. SFD can be used immediately after observing a failing execution and requires no input from developers or bug reports. In addition we present motivating examples and results from a SFD prototype to serve as a proof of concept. Fang Deng, James A. Jones. Fifth International Conference on Software Testing, Verification and Validation (ICST), Montreal, Quebec, Canada, April 2012, pp. 380–389. In this paper, we present a weighted, hybrid program-dependence model that represents the relevance of highly related, dependent code to assist developer comprehension of the program for multiple software-engineering tasks. Programmers often need to understand the dependencies among program elements, which may exist across multiple modules. Although such dependencies can be gathered from traditional models, such as slices, the scalability of these approaches is often prohibitive for direct, practical use. To address this scalability issue, as well as to assist developer comprehension, we introduce a program model that includes static dependencies as well as information about any number of executions, which inform the weight and relevance of the dependencies. Additionally, classes of executions can be differentiated in such a way as to support multiple software-engineering tasks. We evaluate this weighted, hybrid model for a task that involves exploring the structural context while debugging. The results demonstrate that the new model more effectively reveals relevant failure-correlated code than the static-only model, thus enabling a more scalable exploration or post hoc analysis. 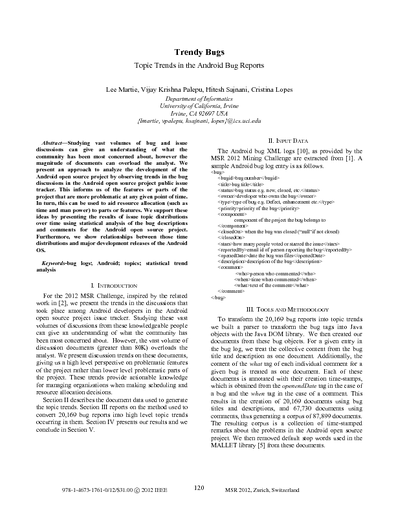 Trendy Bugs: Topic Trends in the Android Bug Reports. Lee Martie, Vijay Krishna Palepu, Hitesh Sajnani, Cristina Lopes. 9th IEEE Working Conference on Mining Software Repositories (MSR), Mining Challenge Short Paper Track, Zurich, Switzerland, June 2012, pp. 120–123. Inferred Dependence Coverage to Support Fault Contextualization. Fang Deng, James A. Jones. 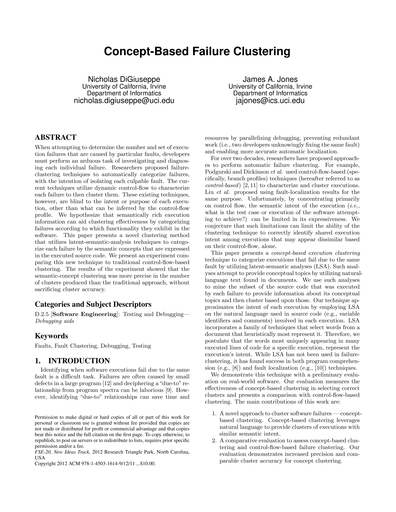 Proceedings of the 26th IEEE/ACM International Conference on Automated Software Engineering (ASE), Short paper track, Lawrence, Kansas, USA, November 2011, pp. 512–515. 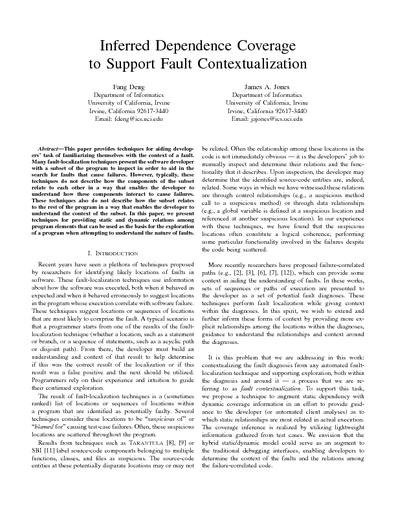 This paper provides techniques for aiding developers' task of familiarizing themselves with the context of a fault. Many fault-localization techniques present the software developer with a subset of the program to inspect in order to aid in the search for faults that cause failures. However, typically, these techniques do not describe how the components of the subset relate to each other in a way that enables the developer to understand how these components interact to cause failures. These techniques also do not describe how the subset relates to the rest of the program in a way that enables the developer to understand the context of the subset. 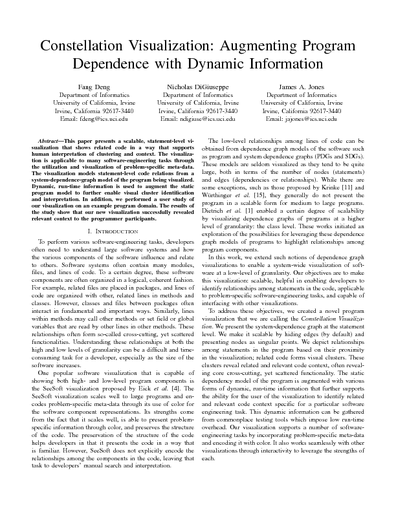 In this paper, we present techniques for providing static and dynamic relations among program elements that can be used as the basis for the exploration of a program when attempting to understand the nature of faults. 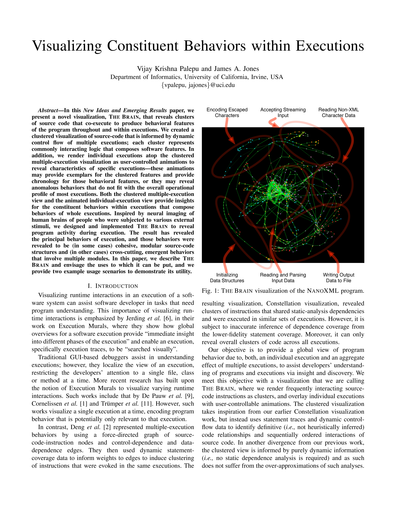 Constellation Visualization: Augmenting Program Dependence with Dynamic Information. Fang Deng, Nicholas DiGiuseppe, James A. Jones. Proceedings of the 6th IEEE International Workshop on Visualizing Software for Understanding and Analysis (VISSOFT), Williamsburg, Virginia, USA, September 2011, pp. 1–8. This paper presents a scalable, statement-level visualization that shows related code in a way that supports human interpretation of clustering and context. The visualization is applicable to many software-engineering tasks through the utilization and visualization of problem-specific meta-data. The visualization models statement-level code relations from a system-dependence-graph model of the program being visualized. Dynamic, run-time information is used to augment the static program model to further enable visual cluster identification and interpretation. 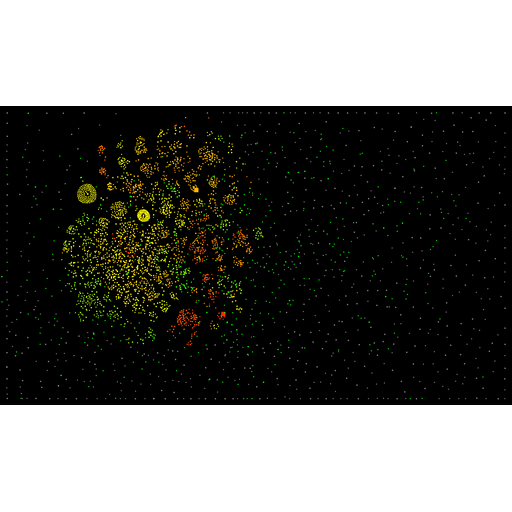 In addition, we performed a user study of our visualization on an example program domain. The results of the study show that our new visualization successfully revealed relevant context to the programmer participants.